"Sampath Speaking" - the thoughts of an Insurer from Thiruvallikkeni: Cricket to flourish at Rwanda ~ Gahanga Cricket stadium ! Cricket to flourish at Rwanda ~ Gahanga Cricket stadium ! Australia need a keeper who catches, not one who chatters – Ian Chappel comments on Peter Neville. Meantime, got overawed by this picturesque stadium – where the national team captain Eric Dusingizimana is sitting looking out over the newly constructed Gahanga cricket stadium a day before it is to be officially opened by the country’s long-standing President Paul Kagame. Can you locate it ? At MCA Cricket Stadium in Pune, Mayank Agarwal brought up his maiden triple century in 490 balls to take Karnataka to a massive total of 628/5 declared to give his side a huge 383 run lead in the ongoing Ranji match. This is the third triple century this Ranji Trophy season and the 43rd in the history of the domestic tournament. He became the third Karnataka player to score 300 runs in Ranji after KL Rahul and Karun Nair. In the 1st T20 against visiting Kiwis, Shreyas Iyer debuted, did make a couple of good saves but did not get to bat; Ashish Nehra has now retired from international cricket, there is one spot up for grabs in Rajkot. India might consider handing a debut to Hyderabad quick Mohammed Siraj or beef up their middle order by including Manish Pandey or Dinesh Karthik. If you are yet to figure out, that stadium is in Rwanda, a sovereign state in Central and East Africa and one of the smallest countries on the African mainland. Located a few degrees south of the Equator, Rwanda is bordered by Uganda, Tanzania, Burundi and the Democratic Republic of the Congo. Rwanda is dominated by mountains. Its principal language is Kinyarwanda, spoken by most Rwandans, with English and French serving as official languages. Rwanda’s president is Paul Kagame of the Rwandan Patriotic Front (RPF), who took office in 2000. The Kingdom of Rwanda dominated from the mid-18th century, with the Tutsi kings conquering others militarily, centralising power and later enacting anti-Hutu policies. Germany colonised Rwanda in 1884 as part of German East Africa, followed by Belgium, which invaded in 1916 during the First World War. Both European nations ruled through the kings and perpetuated a pro-Tutsi policy. The Hutu population revolted in 1959. Tutsi-led Rwandan Patriotic Front launched a civil war in 1990. Social tensions erupted in the 1994 genocide, in which Hutu extremists killed an millions of Tutsi and moderate Hutu. The RPF ended the genocide with a military victory. The economy is based mostly on subsistence agriculture. Coffee and tea are the major cash crops for export. Rwanda is one of only two countries in which mountain gorillas can be visited safely, and visitors pay for gorilla tracking permits ~ and Cricket is flowering in Rwanda. The stadium seen at the start, newly constructed Gahanga cricket stadium, is to be officially opened by the country’s long-standing President Paul Kagame. 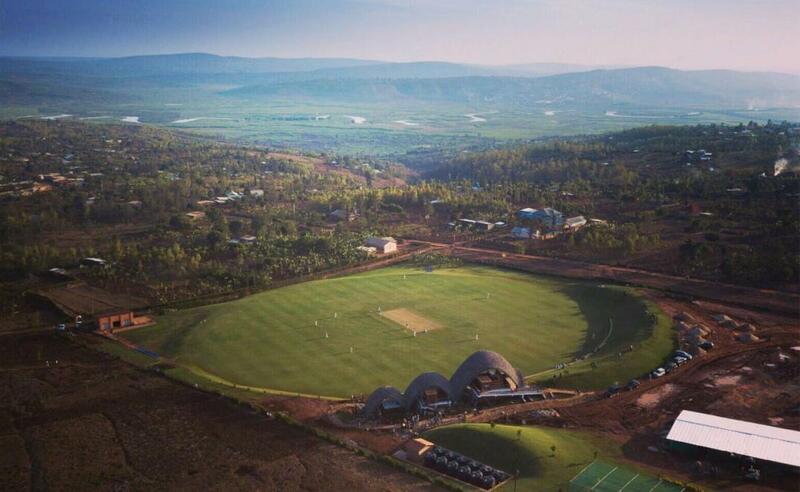 The inauguration marks the end of a remarkable six-year undertaking by British charity the Rwanda Cricket Stadium Foundation who have raised the £1 million required to build the spectacular new home of Rwandan cricket. Dusingizimana, the captain of the local team is a civil engineer, who has served as general manager of the RCSF as they constructed ‘the Lord’s of East Africa’ in Gahanga, about half an hour’s drive from the centre of the capital Kigali. The pavilion, will also serve as an HIV testing centre and restaurant in the future is a fantastic feat of engineering, built using 66,000 handmade tiles in layers without using concrete – the same way as Barcelona’s Sagrada Familia although with the added bonus of actually being finished. Rwanda’s reputation as ‘the land of a thousand hills’ being richly deserved – and all in all could scarcely be more different from where cricket had been played in the country until now. 4th Nov 2017 @ 18:00 hrs.